There are times in life when it seems like everything is possible; times during which the cards that may have been once ours can be reshuffled and opportunities that were previously concealed are revealed. These moments feel almost miraculous, and are too rare to be forgotten. They are celebrated, fondly remembered and more often than not, they have a flavor associated to them. I do no particularly emphasize anniversaries; I believe that life is a celebration and that one needs no excuses when it comes to good food, good wine & good company. In true French fashion, though, “l’exception qui confirme la règle” is this exact time of the year I simply can’t ignore. 11 years ago to date the course of my life changed forever; and what was supposed to be a short visit to the United Nations in Geneva ended up to be the day I met the love of my life. 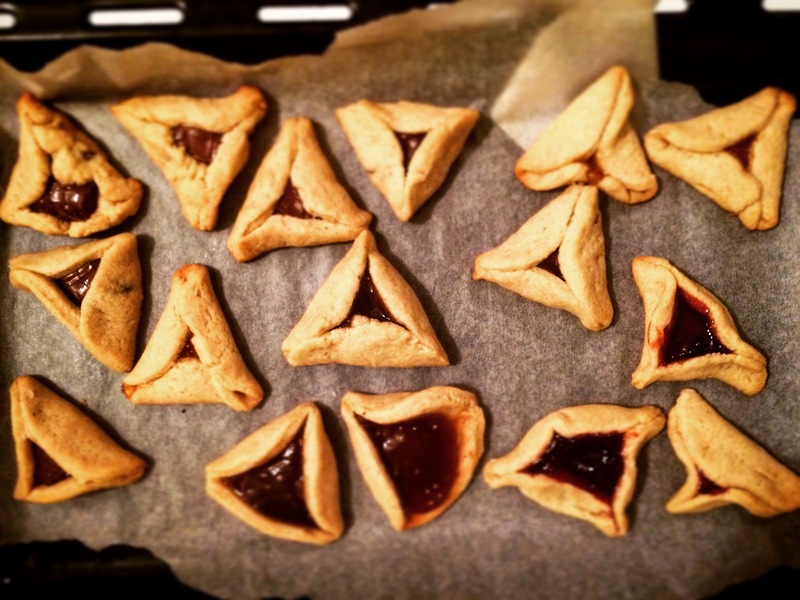 Exactly around that time, the holiday of Purim is celebrated around the world, in a twist of fate, this literally celebrates the turn of destiny and the actions one can take to overcome what may at first seems like the most dire circumstances. I enjoy this holiday as it reminds me that nothing is ever played out in advance, and that I can change the circumstances that affect me. Flavors of 10 years ago are forever associated to the buttery and sweet crumbles of “Hamantashen” cookies. These sweet pastries are filled with jam, or chocolate and are a delightful treat all year round, but more particularly around the month of March. So go ahead, take it all in, drive that change you want to see, and celebrate your ability to be the master of your own universe, even if it starts with baking a cookie … or 2! Filling: Any good quality jam, cubes of baking chocolate, chestnut jam, bits of Halva, or marzipan…. Bake to 180C for 20 minutes or until nicely golden. You will smell the buttery dough a few minutes before they are ready, enjoy! They are ready once the dough is golden, be careful to leave to cool for a sufficient amount of time as the filling is piping hot! 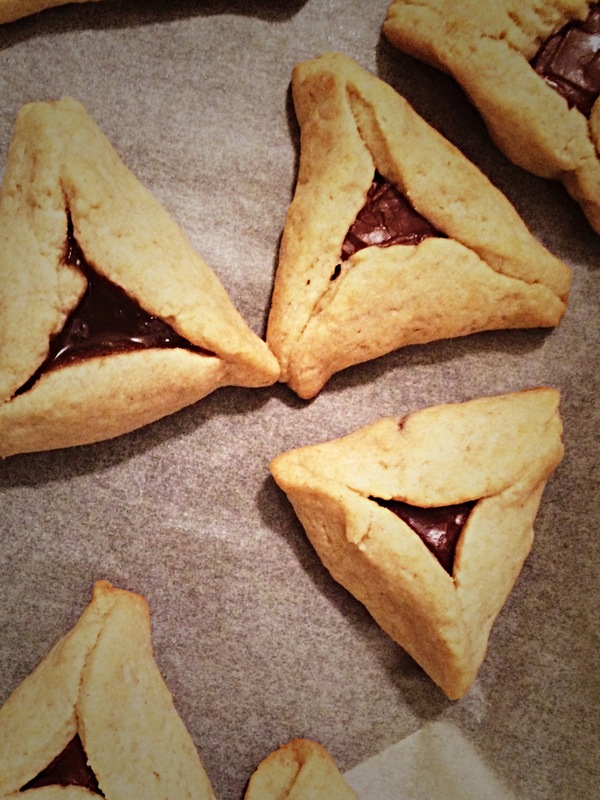 You can make them even more decadent by leting some baking chocolate and dipping them half. These are the first batch made with the kids, They had so much fun putting all kind of different filling and shaping them was a great learning curve! you can see that if you don’t pinch them enough or put too much filling, they will pop… but who cares, they are still perfect to eat! Previous Post Feeding Bébé .. Yeah right! I don’t think I’ve had any of these cookies ever, thanks for sharing!